News from UK Horse Races and the Jones' Horses! Michael Forde follows and writes of the races in England, and helps to keep track of David's horse, Regal Splendour. This page will contain his most recent emails to The Purple Flower Gang, and some UK trivia as an additional treat! Enjoy! Just a quick message. Regal Splendour was not declared to run at Newton Abbot to-day but the fact that he was entered shows the horse is well and that 'connections' are looking for a suitable race for him and are thinking of running him again soon. However, the horse is not engaged this week. The next possible day for him to run would be next Saturday. Nowadays there is a 5-day entry cycle for run-of-the-mill races of the sort Regal Splendour would run in. Saturday's entries will be in the paper to-morrow but they could be on the web now at www.racingpost.co.uk . That is the website of the remaining national daily racing newspaper in Britain. The website used to be a pay site but they saw the light. The funny thing is that I never use it. I prefer to buy the old-fashioned newspaper every day. Using the internet for long periods is still quite a big deal for individuals over here because of long-ingrained background concern about the cost. British Telecom told me to-day that from the end of September my ISP will be able to partake in a cheap-rate off-peak web-surfing scheme called SurfTime. If and when that happens I will be able to use the net much more freely than I have been doing. The geographical spread of National Hunt (meaning 'jumping' - hurdle races and steeplechases) meetings this week indicates to me that Regal Splendour will not run until this day week at the earliest. Opportunities for jumpers in summer are not numerous. National Hunt racing is traditionally a winter sport having grown out of a country and farming background, winter being the time when there was not much to do on the farm and the ground was soft enough to minimise wear and tear on the horses' legs. Up to a few years ago there was no jumping at all in June and July but the demands of the bookies to have 'product' every day to put in front of the bettors led to the introduction of 'summer jumping', as it is unofficially called. The racing authorities did not just cave in to the demands of the bookies for more racing. After putting up some resistance they actively co-operated. They accepted the situation because there is a tax on bookies' turnover and some of it finds its way back into racing, though the government keeps most of it. So, the racing authorities' thinking is along the lines of 'The more racing, the more betting, equals more turnover, equals more tax for the government, so racing gets a bit more from the levy. Let's have more racing'. It was to protect the levy from the cancellation of jump racing during bad weather in winter that led to the building of the three all-weather tracks. The first of these was inside the existing turf courses at Lingfield Park, a place you know well because of Digpast's exploits there. The all-weather tracks ensure there is all-year-round Flat racing too. It's called wall-to-wall racing. At the moment there is racing seven days a week and evening racing too! This will go on for some time yet, but in summer it is Flat racing that dominates so we will have to wait a little while to see the Jones flyer again. Incidentally there was a significant racing achievement in Louisiana at the weekend when a filly called Hallowed Dreams won her sixteenth successive race. This was the Miss Dixie Stakes. Hallowed Dreams has never raced outside Louisiana but she is good. Saturday's victory means she equalled the modern American record for the number of races won in succession. In that regard she is equal with Citation and Cigar - and her next race will be her opportunity to get the record for herself. Citation and Cigar were males and both are legendary horses, well up there in terms of racing ability with 'The Big Red', meaning Man O' War, though that nickname has been used for another great American horse, Secretariat. 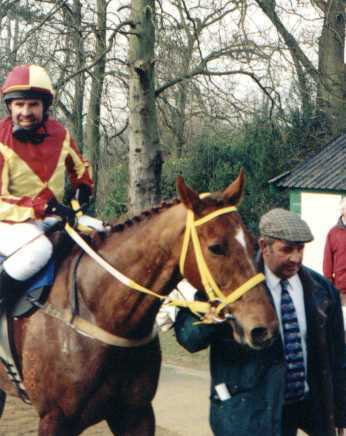 Hallowed Dreams was ridden by "the foggy jockey", Sylvester Carmouche. He got his nickname for hiding his horse in a corner during a long-distance race run in fog. When the horses came around again the bold Sylvester jumped in and won by a street. It really happened. But he won too easily. People became suspicious and the story came out. I believe Secretariat appeared on a US Mail postage stamp a year or two ago. His trainer died recently. Cigar is hale and hearty and in a horse park in Kentucky because he proved infertile at stud. What got me on to this tack was recalling the message from Debbie Sunseri. I noticed her address is in Louisiana. Perhaps the name of Hallowed Dreams has reached her ears. It surely will if Hallowed Dreams wins her next race. I will resist the temptation to make a pun about Hallowed Dreams and Daydream Believers.